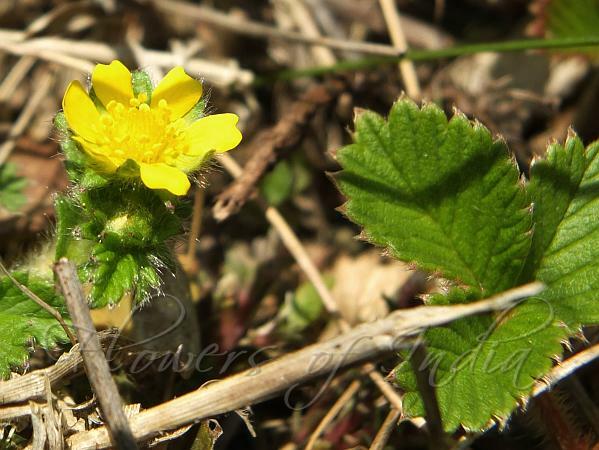 Synonyms: Potentilla nilgerrensis (Schltdl. ex J.Gay) Mabb. 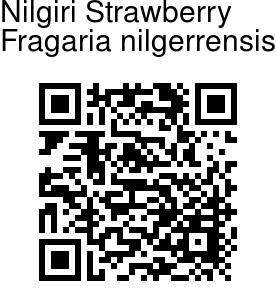 Nilgiri Strawberry is a species of wild strawberry endemic to Peninsular India. It is a perennial herb with leaves 3 x 5 cm, somewhat leathery, hairy, especially below; stipules sheathing; axis to 7 cm long; mid-leaflets obovate, 3.5 x 2.5 cm, base wedge-shaped, margin deeply sawtoothed; laterals oblique, 2.5 x 2 cm. Flowers are borne in erect cymes, up to 5 cm long; flower-cluster-stalks golden hairy. Petals are elliptic, 5 mm, yellow. Stamens are numerous. Pistils numerous, on a convex receptacle; ovule 1. Achenes are numerous, on fleshy torus. Flowering: February-April.